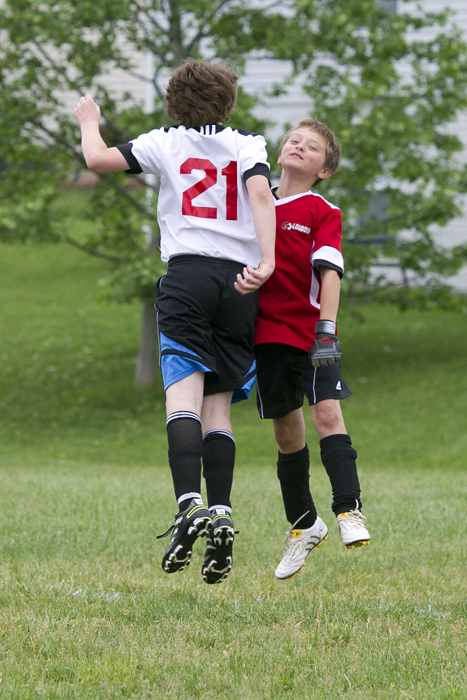 Cameron and Robbie have been on the same soccer team for more than half of their 11 years. They’ve seen a lot of victories and defeats. They’ve witnessed great sportsmanship on the field, and they’ve also observed the very worst that sports can bring out in children and adults alike. They’ve been there for one another, sharing soccer balls, Gatorade, snacks and lots and lots of laughs. Tonight on the way to practice, Robbie and Cam hatched a plan to spend a month in the wilderness together. During our 30-minute drive they started a list of the necessities they’ll need, including 25 pounds of white rice, a canoe and kayak, bow and arrows, waterproof matches, knives and a tent, to name just a few. They intend to live off the land, fishing and hunting for their food. They discussed in great detail where they’ll set up camp and who will take care of the cooking (not Cameron!). I hope that someday they fulfill even a small fraction of this plan, as there’s nothing like having a best friend to share in future adventures. Their initial plan included no “electronics,” until they began talking about camping and setting everything up before dark. Then they had second thoughts. Maybe they’d consider bringing a flashlight or maybe a headlamp…you just never know when the dark may be, well, just a little too dark. what a delightful post! It captures such a special time and relationship–and brings back memories of past adventures. You are so right that such friendships are worth capturing in time–these pals will love reading this in 10 years. Photo is cool too. Thank you! I have fond memories of my best friend back then. We did accomplish a great deal together (and went to John Muir Elementary School together), and we’re still in touch. I appreciate the comment!